SPICE UP YOUR LIFE AND STAY WELL THIS WINTER! With the days growing colder; the winter and cold and flu season is upon us. 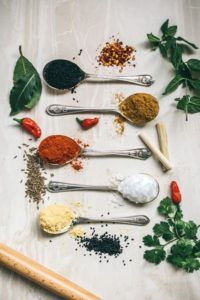 Practicing good self-care and incorporating herbs and spices in our diet can help keep our health and immunity strong; increasing our odds of staying well and not getting as sick when we do catch something. Sleep 7-8 hours a night. Sleep is an underutilized health elixir with many benefits for your health, immunity and mood. Practice stress reduction in the way that best works for you, whether it is a walk in nature, laughing with friends or yoga and meditation. Get some physical movement in each day, you don’t have to go to a gym; every minute of any physical movement and stretching counts! Hydrate! You might not be as thirsty in the winter months, but you still need water for optimum health. Eat well and eat more fruits and vegetables which are packed full of vitamins, minerals and micronutrients that keep healthy and ward off disease. Add more herbs and spices to your diet! Many commonly used culinary spices and herbs have immunity and digestive enhancing properties as well as making our food taste better. Traditionally, most cultures incorporate many spices and herbs in their daily diet to maintain health and prevent illness. Basic food seasonings such as garlic, ginger, hot chilies, horseradish, rosemary, oregano, thyme, basil, sage, turmeric and cinnamon are all useful, especially in the winter season, to promote our vitality. Attend the “Spice up Your Life and Fire Cider Demo” workshop this month and learn how to use more of the herbs and spices that are widely available and in your cupboard. Learn how to make infused vinegars and watch a demonstration of how to make Fire Cider! 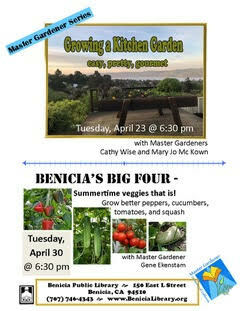 Learn from Master Gardeners how to grow an easy, pretty, gourmet kitchen herb garden.